One of my high school buddies Sekou, sent me this link. These are some great shots of buildings in Georgetown, Guyana. Picture 41 of the series is of my old high school. I can still see my 3 C class room. Talk about going back in time. Having problems managing your digital photos? Just installed Picasa and it did a search for photos on my hard drive. 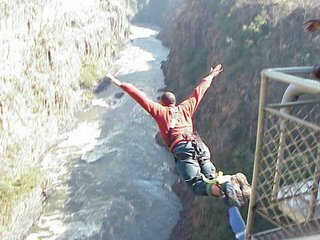 I can’t believe I forgot this photo of me bungi jumping 400 feet over the Zambazi river. What a rush! !